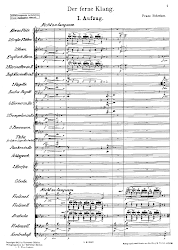 I’m quite used to directors choosing to unfold a different narrative from the one that composer and librettist present in their work, and am generally accepting of this when done convincingly and with perceptive purpose. But I tend to draw the line at playing around with the musical integrity of a through-composed opera in order to pursue this goal. 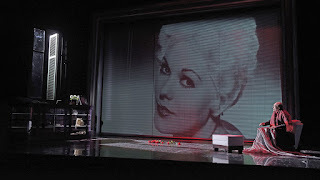 So when Jakob Peters-Messer cuts a crucial scene at the end of Korngold’s Die tote Stadt – the one in which Marietta returns to collect her mislaid umbrella – in order to maintain the fact of the character’s death to the very end, one feels a loss of faith in what one has seen up to that point. And up to that point it had indeed been a generally lucid and well-presented rethinking of a work that offers plenty of ambiguity of its own: how much is real and how much is Paul’s dream? 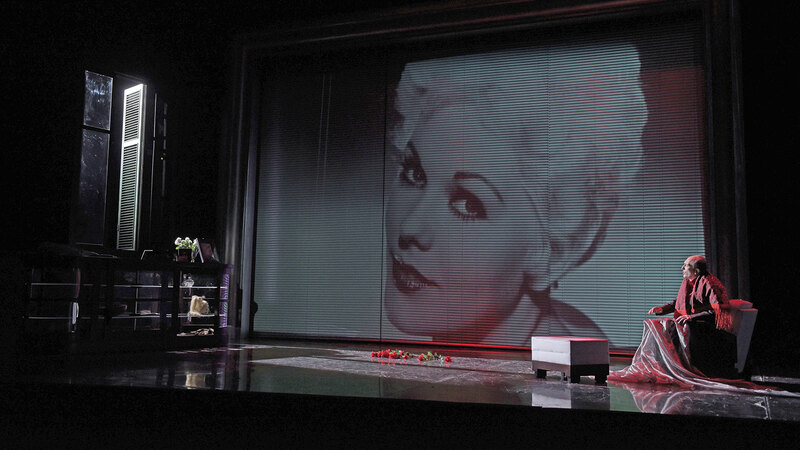 Guido Petzold’s set uses a proscenium arch midway back effectively to mark off the boundary between these two states. Paul’s life takes place wholly in front of this translucent-curtained divide, and the other characters flit between the two, between his conscious and subconscious experience. As the final stage curtain falls, Paul is left alone in front of it – still facing his grief in the real world. Yet when we realise just before this ending that his strangling of Marietta was less the imagined expiation of his attempts to keep the memory of his dead wife alive than a last desperate act of a deranged man, one is left feeling betrayed of one’s trust in the director. There were some other questionable aspects as well, such as the sinister mauling of a young boy – the young Paul? – by Catholic priests at the climax of the Act III religious procession. The stifling effect of the Roman church on the ‘dead city’ of Bruges is a theme in itself (and explored in more depth in the recently revived Frankfurt production by Anselm Weber) and there’s room for an attempt at explaining the roots of Paul’s funerary idolatry in his childhood, but neither aspect was really pursued here. The shrine in which Paul keeps the mementos of his wife is inevitably the sacrificial altar, as it also furnishes the dancers in Act II with their Venetian gondola (a craft often said to resemble a coffin). So, flashes of brilliance, then, in a generally too ill-defined staging. Fortunately, the musical virtues went a long way to make up for things. I had heard Wolfgang Schwaninger’s Paul in Regensburg in 2012, and was impressed then by his vocal command of what must be one of the most challenging tenor roles this side of Wagner. Here that ringing tone and stamina were again in evidence, while in a more dramatically intense, and indeed deliberately unsympathetic characterisation from this production’s director his acting was even more involving, and his forestage singing of the reprise of the Lute Song at the end was as moving as it has ever been. Israeli soprano Noa Danon, who I heard as Donna Clara in Theater Lubeck’s Zemlinsky double bill in 2014 and who has been in the Magdeburg ensemble since 2009, threw herself physically into the role of Marietta – as a convincing dancer, too – and coupled her stage presence with a vocal performance that was tonally alluring and technically fine-tuned. Roland Fenes’s Frank and Undine Dreissig’s Brigitte seemed hampered by Peters-Messer’s rather wooden direction of their characters (maybe this was a deliberate thing), and Thomas Florio’s Fritz sang Pierrot’s Lied with charm if without the truthful sentimentality of the best interpreters of the role. As for the orchestral playing under Kimbo Ishii’s direction (and the conductor must share some blame for the aforementioned directorial failure in agreeing to the shameless filleting of the final scene), after a somewhat lacklustre opening (not helped by the theater’s dry acoustic) it became ever more involving and seductive.